There was a time when the more exotic and rarer the plants in your garden were, the better your garden was. But with a growing awareness of the natural environment, that isn’t true anymore. In many parts of the country there is concern about exotic species of plants that have escaped from gardens into surrounding woods and fields. Although the extent or impact of that spread is not always clear, some people feel that growing exotic species is not such a good idea. Perhaps even more significant is an appreciation of the natural beauty around us. There are beautiful and interesting plants everywhere and our own native plants have just as much visual beauty if we open our eyes to it. There is another factor to consider too. Exotic species can be susceptible to local pests and diseases because they have never encountered them before. Local species have developed resistance through thousands of years of living together. So these exotics end up needing spraying and pest control, which often involves chemicals many people do not want to be around. So switching to native species can also help keep our environment free of harmful chemicals. A perfect example of that is seen with birch trees. These lovely, fast-growing trees have a unique delicate look that is perfect for smaller gardens. The one most commonly seen, with peeling white bark, is an exotic, the European White Birch, brought over by settlers nostalgic for home. Unfortunately it is often attacked by a native insect, the Bronze Birch Borer, which eats the inner layers of the bark and quickly kills the tree. This pest can only be controlled with strong chemical sprays, and unsprayed trees usually have a short life. However we have a number of native birch trees, just as beautiful and with their own special features, that are not affected by this pest and will usually live a long life of over one hundred years. 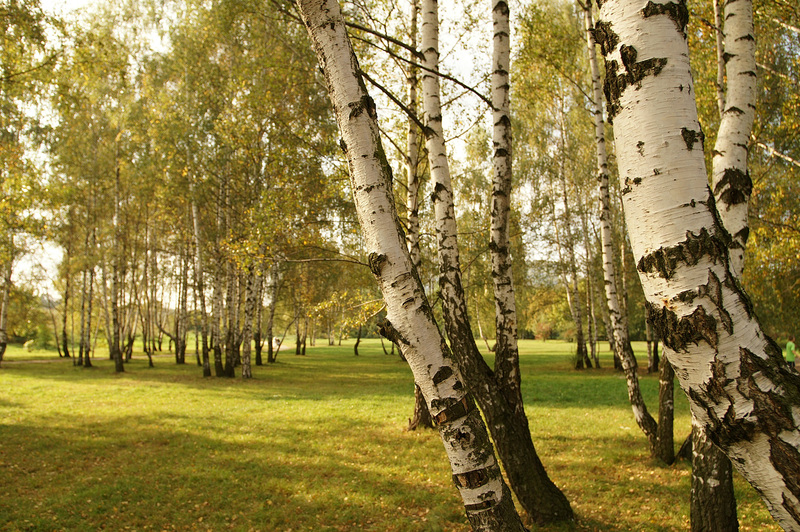 A good example is the Black Birch, which is not only resistant to most pests, but is also a unique and lovely tree that grows well in the coldest parts of the country. It has beautiful, glossy, red-brown bark and will grow in most kinds of soil, but is especially useful for clay and damp soils. If you live in warmer areas most birch trees do badly, but the native River Birch thrives in heat and as the name suggests, grows well in wet and even flooded areas, along a stream for example. With some watering in the summer months it will also grow well in regular soil. The River Birch has attractive peeling bark in pink, red and tan colors. The thought of oak trees conjures up images of ancient giants, perhaps with Robin Hood riding by, but native American oak trees have a lot to offer in any garden, and are more attractive in many ways than the English Oak. Top of the list goes to the oaks with spectacular fall color – the well-known Red Oak and the even more beautiful and rarer Scarlet Oak. These natives of the eastern forests turn to rich and brilliant shades of red in the fall, contrasting and complimenting the more familiar Maple trees. The Scarlet Oak is also a tree that does well on dry soils, which is where it naturally grows, so if you have sandy soil and are looking for a grand and long-lived shade tree for your yard, then look no further than the Scarlet Oak, which is hardy everywhere, drought-resistant in these times of water shortages and will knock your socks off with its brilliant scarlet leaves every fall. For tough conditions and urban pollution, the Pin Oak is a great choice if you have space for a large tree. A real ‘grow-anywhere’ tree, this oak has leaves that turn in fall to glowing shades of bronzy red, before turning light brown and conveniently staying on the tree for most of the winter, a real bonus if you have an ugly view to screen. Since it is a fast-growing tree, putting on three feet each year when young, it is a great barrier tree to quickly hide an unsightly scene, reduce traffic noise and give privacy all year round. There are a variety of other trees in our forests, some of them smaller and living in the shade of their larger cousins. This habit makes them ideal for our smaller gardens, often shaded by buildings or large existing trees. A great choice for a location like that is the American Hornbeam, once treasured for its hard wood that shone like horn when polished and was strong and smooth enough to make axe handles and even golf clubs. Today this tree is chosen for shady gardens where a medium-sized tree is needed. Cold-hardy, adaptable to all soils, including clay, and growing just 20 or perhaps 30 feet in height, this is a graceful tree, with attractive fluted leaves, a rounded crown and beautiful fall colors of yellow, orange and red – coloring well even in shade, where other fall trees often fail to color. So if you need a lovely, less-common tree for a smaller shady garden, the American Hornbeam is the ideal choice. Beneath all these trees it is nice to be able to fill the spaces with interesting shrubs and there are lots of choices to choose from among our native plants. Once harvested as a source of oil of wintergreen, used in everything from chewing gum and toothpaste to aromatherapy, this oil is now manufactured artificially, but the shrub – the Spicebush – remains in our woods and also in our gardens, as an attractive 6 to 10 foot bush. Carrying interesting yellow flowers all along the branches in spring, red berries in fall that can be used for both sweet and savory dishes and are the reason for its alternative name of Allspice Bush, and then bringing lovely tones of gold to the fall garden, the Spicebush will grow in full sun to partial shade. It looks lovely in a group beneath larger trees, edging a wooded area for example. Many of these plants come from the eastern forests, but there is a real western beauty among our native shrubs, and that is the Western Redbud. This spectacular shrub can hold its own against the most exotic of imports and indeed is highly priced as an exotic in Europe and Australia. Different from its eastern cousin, it thrives in the hotter, drier conditions more common to the West and it is smothered in spring with brilliant purple-pink flowers clustered all along the bare branches. Some evergreen shrubs, like Boxwood and Holly, have their native cousins too and with a little careful choosing, even these plants that make the backbone of most gardens can be native and not exotic. So you don’t have to abandon familiar faces, just switch to their American relatives, which were often ignored by settlers homesick for the familiar. Today we bring fewer prejudices to judging beauty and it is easy to see the charm and grace among our native trees and shrubs and bring these treasures into our gardens to enjoy every day, not just on hiking trips or walks in the woods.